Most of the activities concerning the design review of new products based on Virtual Reality are conducted from a visual point of view, thus limiting the realism of the reviewing activities. Adding the sense of touch and the sense of hearing to traditional virtual prototypes, may help in making the interaction with the prototype more natural, realistic and similar to the interaction with real prototypes. Consequently, this would also contribute in making design review phases more effective, accurate and reliable. 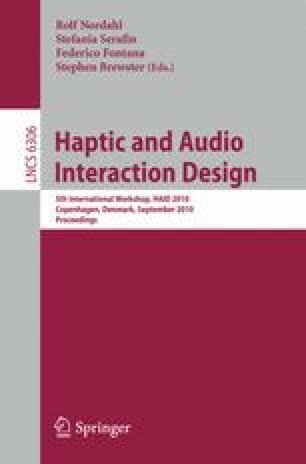 In this paper we describe an application for product design review where haptic, sound and vision channels have been used to simulate the interaction with a household appliance.